Ack! Please, do me a favor. Don’t look at your calendars! Don’t tell me that it’s just 12 days until Christmas Eve. I had grand plans for my holiday preparations this year, and what do you know! It all went flying out the window with a battle between a stomach bug and a two-year old. I had every intention of getting this gift guide published sooner, but we all know good intentions don’t guarantee you’ll get where you’re trying to go! I was trying to think of a way to classify my list of gift ideas, and I’ve come up completely short. I guess the best way to describe it is gifts brought to you from different homesteads! 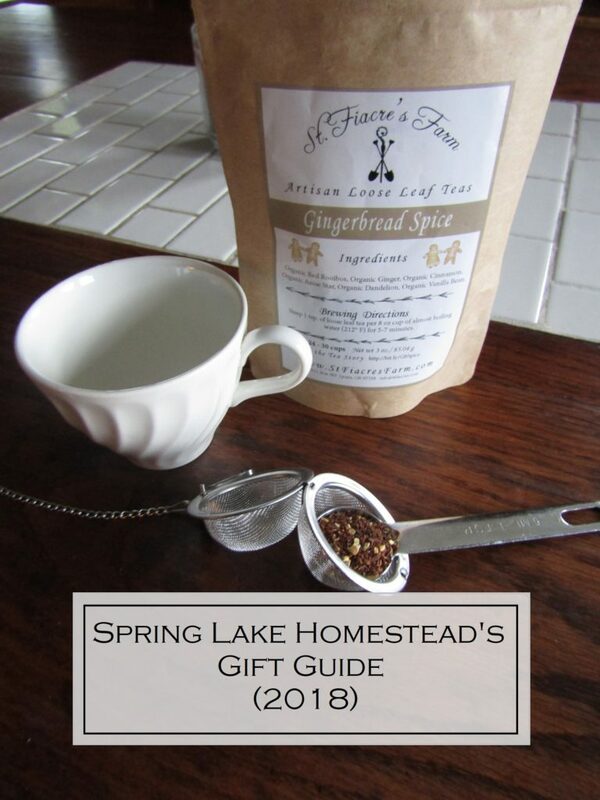 The Spring Lake Homestead Gift Guide (2018): St. Fiacre’s Tea– I recently had the opportunity to taste test some loose leaf tea from St. Fiacre’s Farm, and I was impressed! Honestly, I’m not much of a tea drinker myself (I know, that comes as a shock to some since Miss Lady and I host a genuine tea party for her friends every year), but I really did like their Gingerbread tea! Scott and the kids get into tea far more than I do. I’ve never intentionally purchased a loose leaf tea before, but I will definitely be going back to their site when I need some more tea! They have a great variety of different herbal teas, and plenty of information on each kind of tea that they offer. Needle Keeper- I don’t do a ton of hand-sewing, embroidery, or cross-stitching, but when I do, I usually want to do it somewhere comfortable, while doing something mindless (like watching a movie). But having kids, the thought of losing a needle in the middle of a room or on a couch is a little terrifying. It’s amazing how even if you are extra cautious, those little hand needles can suddenly disappear on you. My friends Scott and Leah (of North Country Farmer) recently started selling these needle keepers from their homestead, and I really need to get myself a few of these. (Hint hint!) (If you are looking for other gift ideas for that person in your life who loves to sew or wants to learn, check out The Sewist’s Gift Guide from last year!) Never Buy Bread Again- Speaking of bread… I think I’m starting to become a cookbook collector, and this is one I’ve been wanting to add to my collection for awhile now. I’ve tried many of the recipes on Laurie’s site (Common Sense Home) over the past few years, and I don’t think I’ve ever had a recipe that disappointed. This is more than just a cookbook, and it’s more than just a beginner’s manual. I’m pretty sure Scott would be requesting that we try all of the flavored butter recipes!From the web page: “The book includes full color photos, so you know what the finished bread should look like, and stories from our family about the recipes and baking traditions. It has a spiral binding so that it lays flat on the kitchen counter for easy reading while cooking. Some of these recipes have been featured on the website, others are exclusive to the book.” The Art of Homemade Bread- One of the things I’ve been working on over the past few years have been my bread making skills (or complete lack thereof). When I ran across a free, online basic bread making course, I had to take it. I was so impressed by what a difference those tips made. After that, I had the opportunity to take the full course, and it was well worth my time! I was amazed at how much there is to know about making good bread. The course would be a great gift for somebody who needs help improving their bread making, who wants to learn for the very first time, or who wants to get into grinding their own wheat and the ins and outs of that subject. And Caroline (of Homesteading Family) was very helpful in any way I needed. The Do It Yourself Homestead- I’ve had the pleasure of chatting with Tessa a couple of times after I had purchased a copy of this book for myself, and she’s as sweet as can be. I absolutely LOVE this book. She breaks down homesteading into different “levels” and helps those who are interested in furthering their journey into this life figure out what steps they might want to take next to expand what they are doing. It’s not a book just for country folks like us… this is a book filled with ideas for just about anybody. They’ve done a good chunk of their homesteading in a variety of settings, so she has a lot of great first-hand experience to offer up. I could come up with a list of gift ideas for homesteaders that is a mile long, but I wanted to do something a little different. I wanted to help support the friends I’ve made over the last couple of years who are sharing their talents with others and trying to support their own homesteads. Love~ Danielle P.S. Some of you may have seen a post that went up recently about some linen bread bags. I still have the page up, but it’s more of a sample page than anything…. I didn’t realize it was going to get published as a post! Anyway, I’m still working on the details on any sales pages, but I have a few extra bags that I’d be willing to part with if any of you are interested in purchasing one as a gift. I’m hoping to be able to make more after the holidays and figure out how to get the cost down and work out the kinks on any future sale page offers! In the mean time, if you were interested in purchasing one as a Christmas gift, contact me and we can discuss price, payment, and shipping!